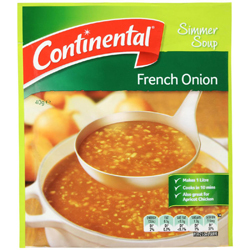 This soup is quick and easy to make, you could have a tasty French onion soup ready in 10 minutes. Each packet makes 1 litre of soup simply by adding water. Get creative and try adding it to chicken stroganoff for a great meal. Onion (71%), Potato Starch, Salt, Corn Starch, Sugar, Yeast Extract, Mineral Salt (Potassium Chloride), Flavours, Food Acid (Sodium Citrate), Parsley, Colours (Caramel IV, Turmeric), Sunflower Oil, Flavour Enhancer (E635), Spice Extract.